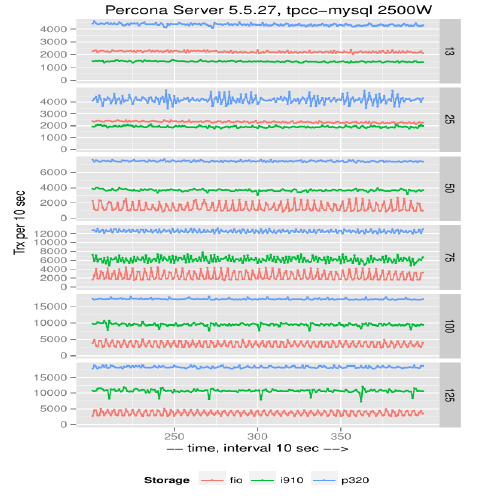 This post comes from Vadim Tkachenko at the MySQL Performance Blog. 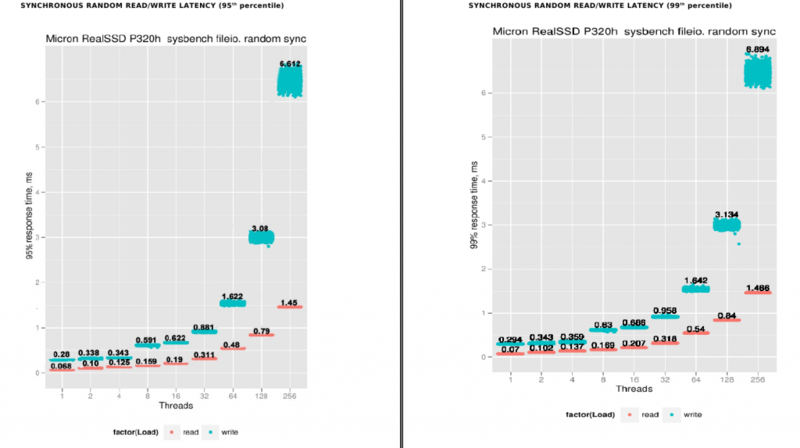 The Micron P320h SSD is an SLC-based PCIe solid-state storage device which claims to provide the highest read throughput of any server-grade SSD, and at Micron’s request, I recently took some time to put the card through its paces, and the numbers are indeed quite impressive. For reference, the benchmarks for this device were performed primarily on a Dell R720 with 192GB of RAM and two Xeon E5-2660 processors that yield a total of 32 virtual cores. This is the same machine which was used in my previous benchmark run. A small handful of additional tests were also performed using the Cisco UCS C250. The operating system in use was CentOS 6.3, and for the sysbench fileIO tests, the EXT4 filesystem was used. The card itself is the 700GB model. So let’s take a look at the data. With the sysbench fileIO test in asynchronous mode, read performance is an extremely steady 3202MiB/sec with almost no deviation. Write performance is also both very strong and very steady, coming in at a bit over 1730MiB/sec with a standard deviation of a bit less than 13MiB/sec. 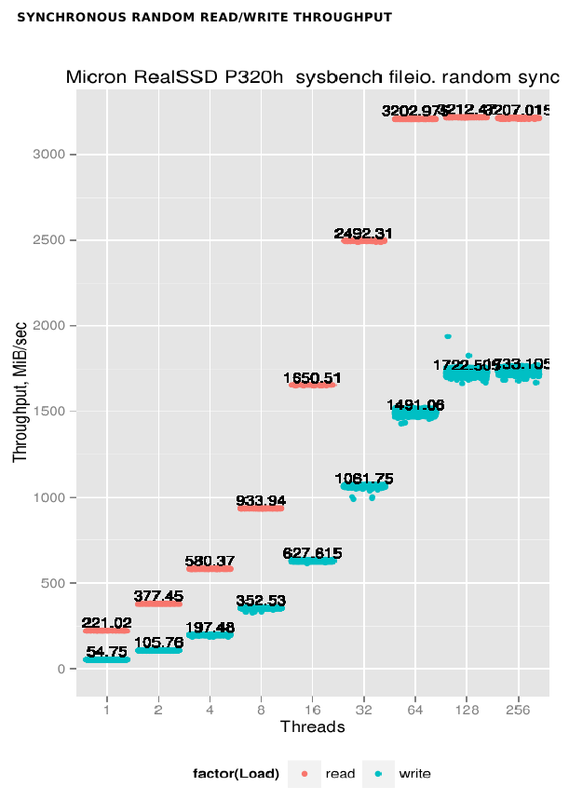 When we calculate in the fact that the block size in use here is 16KiB, these numbers equate to over 110,000 write IOPS and almost 205,000 read IOPS. 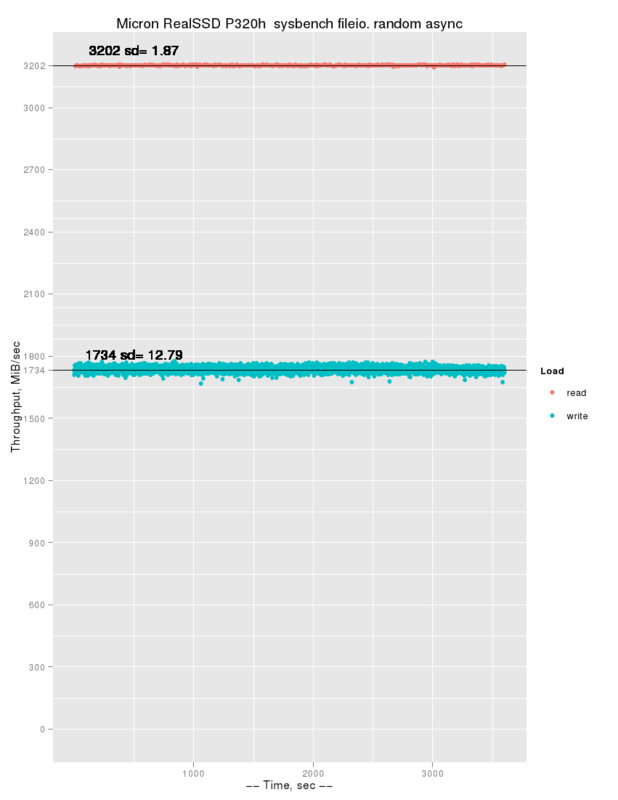 Synchronous read reaches peak capacity somewhere between 32 and 64 threads, and synchronous write tops out somewhere between 64 and 128 threads. 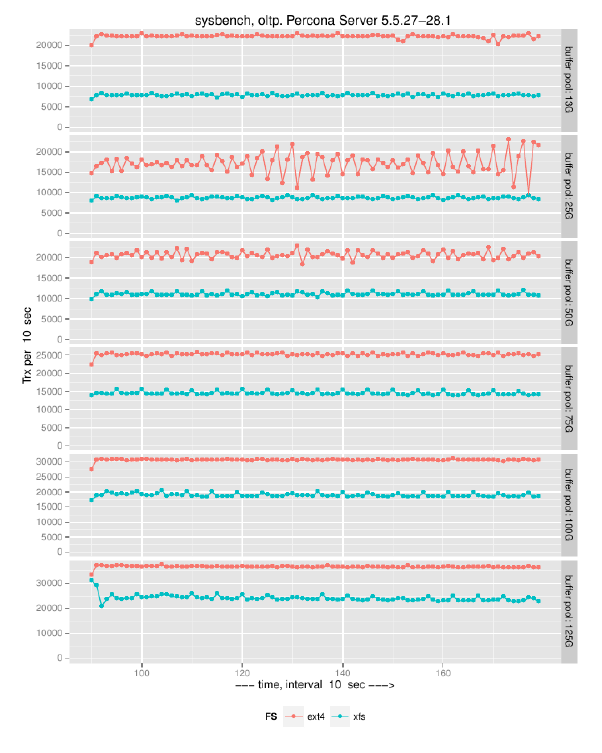 The latency numbers are equally impressive; the next two graphs show 95th and 99th-percentile response time, but there really isn’t much difference between the two. At 64 read threads, we reach peak performance with latency of roughly 0.5 milliseconds; and at 128 write threads we have maximum throughput with latency just over 3ms. In the final analysis, there may or may not be faster cards out there, but the Micron P320h is the fastest one that I have personally seen to date.